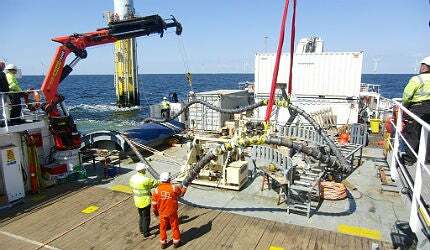 CPNL Engineering is a challenging engineering firm with simple proven concepts for offshore cable projects. CPNL engineers and supplies a solid alternative for polyurethanes, which copes with higher loads and tensions. As a result, CPNL is able to provide cable-related protection systems for fibre-optic cables, power cables, umbilicals and several types of pipelines. In areas where cables or pipes could be prone to failure, CPNL has developed a proven system based on articulated pipes. A redesign made in 2009, which excluded the use of fasteners, contributed to simple assembly and multiple application possibilities. CPNL has supplied articulated pipes for shore-end landings, as a robust bend restrictor and as a combined cable protector and flexible quadrant for cable installation. With a flexible quadrant, cable installation could be further improved, and more deck space made available, as a static quadrant is no longer relevant. The company’s pipes are the strongest available in the offshore market, with top performances on static and dynamic tests performed at independent test facilities. The articulated pipe with integrated bend radius prevents cable damages with loads up to 489kN. All pipes are available with a special PU coating to actively avoid corrosion. This type of coating has a long track record in maritime environments to avoid corrosion, and it is able to cope with high impacts and facilitate surveys with noticeable RAL-colours. To offshore wind farms, CPNL Engineering has provided custom-made belmouths, centralisers and articulated pipes with DNV-GL material certificates reviewed according to EN10204 (3.1C and 3.2C). Ever-increasing underwater networks will lead to more cable crossings in the upcoming years. Such activities require rock dumping, concrete mattresses and divers to anchor the system, which comes hand-in-hand with a higher risk profile. In 2013, CPNL started to design an alternative that excludes diver intervention at installation. This modular design can be shortened and extended with blocks of polyurethane with sediment storage compartments with a solid centre line of articulated pipe crossing over the complete length. On both sides of the mattress, the pipes will run further to avoid cable damages in the trench area. As a result, a cable installation vessel and a trencher will perform the activities. In 2014, CPNL Engineering made a successful entrance into the offshore oil and gas market by delivering 21 compact hang-offs with a unique wedge system to a Mexican platform. It was the first hang-off to achieve temporary clamp tensions up to 78kN – with only 4 components – and permanent clamp tensions up to 200kN. Both endurance tests were successfully completed with higher than required clamp tensions. The latest version of the hang-off, made of seaworthy aluminum, excludes the use of epoxies due to mechanical seals for air tightness. In this case, type tests have been performed to verify air tightness up to 3bar of pressure. This product is 66% lighter in weight than the previous version in nodular cast iron. Do you have an idea about where you want your cable project to go? Or would you like to receive some help on making your next cable project a success? CPNL Engineering is an independent engineering firm with no in-house production facility, which contributes to our open mind of creating tomorrow’s solutions. After months of accelerated reliability testing, CPNL Engineering has announced the successful completion of dynamic tests with its articulated pipes at the University of Exeter, as part of the EU-funded MARINET research programme.